THE INDUCTION OF 100 new garda recruits represents a “very public expression” of Ireland’s recovery, the Justice Minister said. She was speaking at this afternoon at the Garda College in Templemore, Co Tipperary, where the new recruits began their training last week. Almost 25,000 people applied for the jobs, but just 100 were selected – 82 men and 18 women. Of the 100 students, 26 come from Dublin and 12 from Galway. There’s also one from Suffolk and one from London. The majority are aged between 21 and 25, with one recruit on the edge of the age limit at 35. 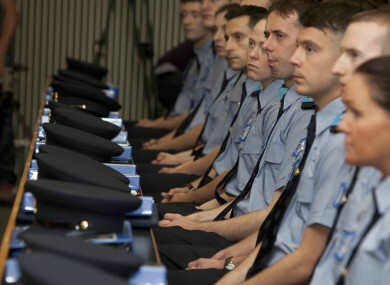 Included in this new group of trainees were 24 former Garda Reserve members. The new recruits come a variety of backgrounds, previously working in areas such as engineering and nursing, with degrees in everything from social studies to biotechnology. Minister for Justice Frances Fitzgerald said she intends that there will be “seamless ongoing recruitment”, with further announcements to be made later this year. “The recent years of fiscal correction have seen our public services constrained. Today, your recruitment marks a very public expression of how the tide has turned,” she said. However, the Minister said the recruits will have to win the trust of the public due to recent controversies. “I am committed to putting in place, and where necessary reforming, the organisation, structures, practices and systems to support the men and women of An Garda Síochána to effectively deliver the best possible policing and security services for our communities and our country, she said. We are starting with major changes to the administration and oversight of policing and further changes will inevitably follow to ensure that the high quality and respected service that An Garda Síochána has provided for the last 90 years is continued and enhanced to better meet the realities, challenges and expectations of 21st Century policing. The students will sit a BA in Applied Policing, accredited by the University of Limerick, in a programme that lasts 32 weeks. A number of changes have been adopted to address a “theory/practice gap” identified in a 2009 review. Once students have successfully completed this first phase, they will be conferred with full policing powers and move onto the second phase. This consists of ‘work-based learning’ as a Probationer Gardaí, and lasts 34 weeks. The third and final phase lasts 38 and sees probationers “act autonomously in their role as members of An Garda Síochána and follow a more integrated programme of professional competency learning and development under supervision”. “The rigorous training that the students will be facing will equip them with the tools they need to provide the professional, efficient policing service that is expected by Irish communities today,” Chief Superintendent Anne-Marie McMahon said. Email “The new garda recruits will need to "win the trust" of the Irish public”. Feedback on “The new garda recruits will need to "win the trust" of the Irish public”.